What lure do you think is the number one striped bass lure in the world? This lure has caught more striped bass than almost all other striper lures combined. It's the bucktail jig. There are several basic bucktail jigs. ReAxtion Lures offers two of the most popular styles in several different sizes and colors. 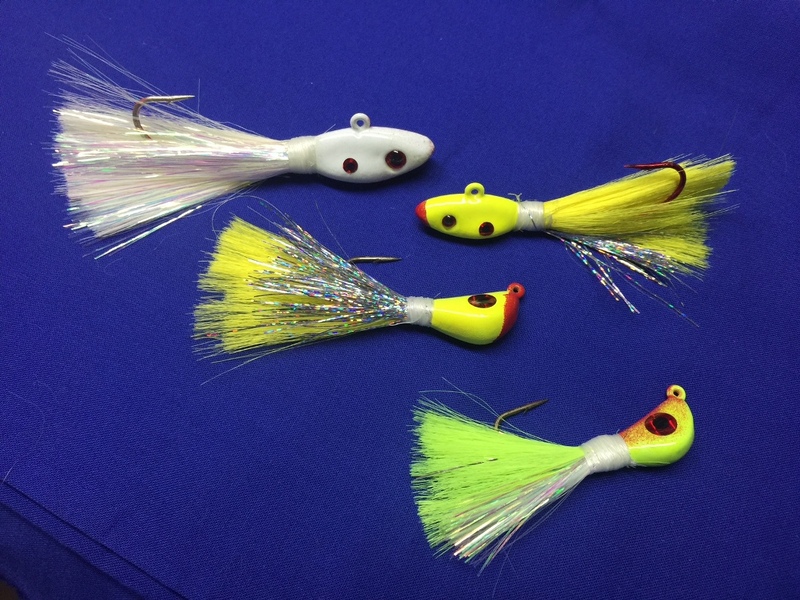 These are (1) the banana jig and the (2) traditional Bucktail jig. What makes the ReAxtion Bucktailer different? THE BUCKTAILERS. ReAxtion Bucktailers have MORE hair than normal. The extra hair makes the lure's sink rate slower so that it looks more natural on the fall. I leave the bucktail long so that you can trim to your preference. These are excellent lures for casting along the rocks as well as using on downriggers. I personally always add a white plastic trailer on the hook. The 4 inch Mister Twister grubs are excellent. Some of the guides use 6 and 7 inch white plastics as trailers. Use your imagination because the combinations are endless. Even Uncle Josh's pork rinds make excellent additions on the Bucktailers for attracting those linesides! Every Bucktailer also has flashabou tied on it. The most popular are metallic smoke, silver, and glow chartreuse. The color combinations I sell are the most popular. Try some today!! All lures are individually hand painted and none are the same. The lure colors with highlights vary from just the nose being highlighted to the back and/or belly of the lure being highlighted. I hand tie each bucktail and finish off with six (6) over-hand loops to prevent the thread from coming loose. I then seal the thread. I choose colors for the buck tail that accenuate the lure. There are too many combinations to list so I choose the tail colors as if I were using these myself. This Web Site designed & built by paokie@sbcglobal.net and perfected by Axman ! !